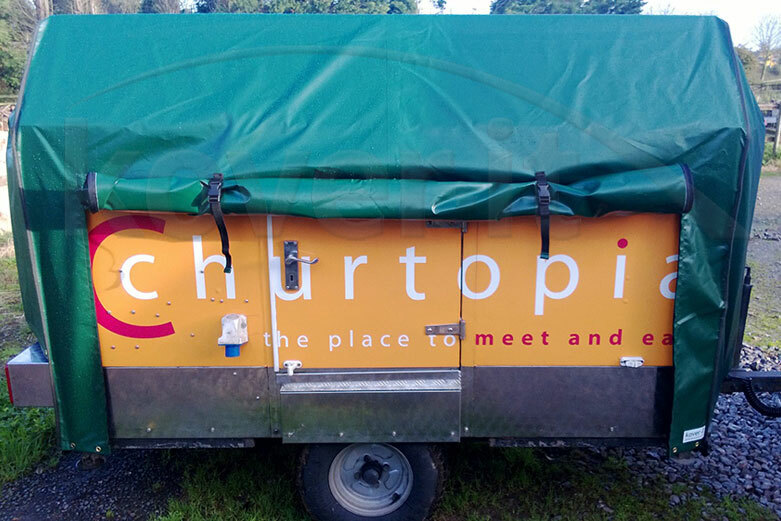 Recently we manufactured this heavy duty waterproof trailer cover for Churtopia. Churtopia is a business which serves sweet Spanish snacks to the South West. They use their Hydraulic Roof Catering Trailer to make and sell their delicious food from, so it is important for them to protect their trailer whilst it is not in use, especially when travelling from place to place. This highly protective trailer cover is manufactured from PVC-ST making this trailer cover extremely durable, strong, long lasting as well as easy to clean. It protects the trailer from rain, snow, the suns damaging UV rays, dirt, bird droppings, as well as scratches caused by flicked up stones whilst on the move. This easy to clean trailer cover also ensures the trailer is kept clean and dry whilst in transit, so they can keep their mobile catering trailer in pristine condition. As you can see this high quality waterproof trailer cover fits Churtopia’s trailer well, this is important for maximizing protection, especially for when in transit. There are eyelets around the bottom for the shock cord to secure it in place, however as you can see the cover is so well fitting the customer may only wish or need to use it on motorways and in very windy conditions (though we do always advise using the shock cord). Since the green heavy duty trailer cover is being used whilst the trailer is in transit, it is higher at the back to allow for the registration plate to be visible, we also made sure there was enough room below for the tow bar. The customer also requested for the ability to still show their logo whilst the cover is on, therefore there is a side panel which can easily be rolled up, allowing their name to be visible. This side panel was also important for the customer to still gain access to the cupboard in the trailer without having to take the cover off. The side panel is easily unzipped, rolled up and held secure by the 2 straps which clip in and can be adjusted. The flaps either side of the strong commercial grade zips help protect the zips from water and dirt, hence lengthening the lifespan. 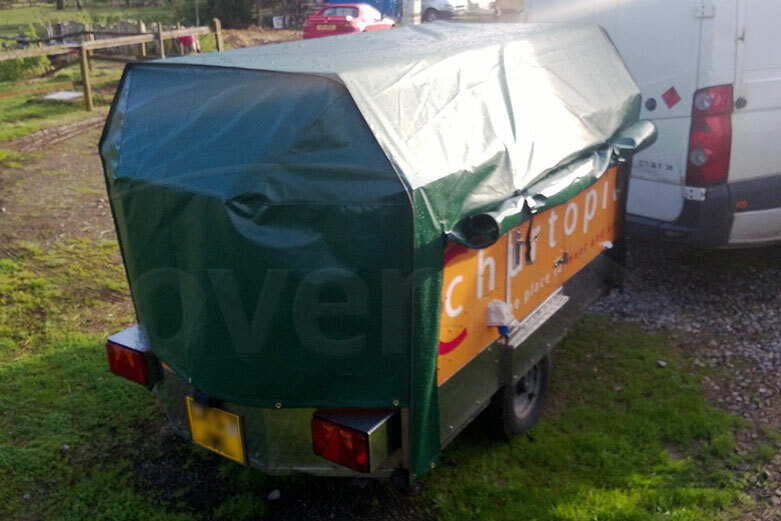 Churtopia chose to have a custom made trailer cover as they wanted a very well fitting waterproof trailer cover that allowed for the shape of the top. To ensure we had all the measurements needed for the workshop, our friendly helpful team helped guide the customer where to measure using simple arrows on their pictures sent. We use this procedure for most of our bespoke covers, by seeing an image of the front, back and both sides we can help make it easier for the customer to know where to measure, thus making confirmations as quick and easy as possible. 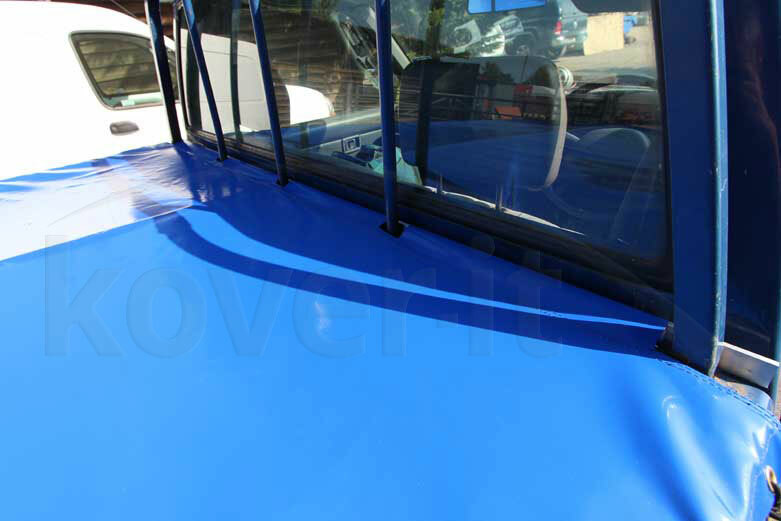 We have manufactured many highly protective waterproof trailer covers, and for all sorts of shapes and sizes. 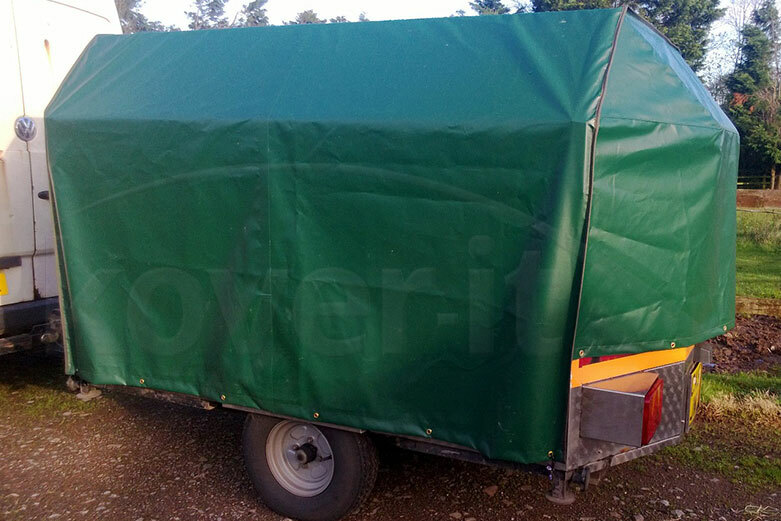 Our heavy duty trailer covers are manufactured from PVC-ST which is a commercial textile so strong that the same material is used for lorry side curtains which are constantly under high use and pressure every day. PVC-ST is very strong, waterproof, dust-proof, corrosion resistant, and heat-resistant which makes it able to cope in even extreme conditions. 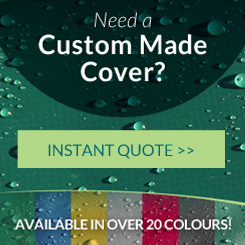 We offer 5 years guarantee with every cover we manufacture out of this material, though nearly all of our covers have lasted customers 10 years plus. We are also able to manufacture out of a range of different colours – Black, Green, yellow, blue, brown, grey, red, white, as well as high gloss colours. The PVC-ST can also be sign printed onto, which is useful for companies to add their own logo or name to the cover. Therefore even whilst the trailer is covered, the sign printed heavy duty trailer cover can still attract attention. As well as being highly protective, our PVC-ST waterproof trailer covers also look and feel very appealing, superior to using a tarpaulin. 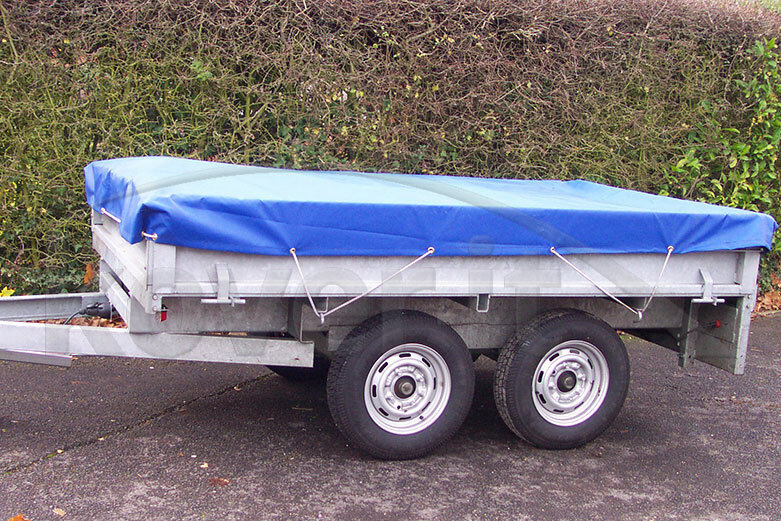 Below is a blue waterproof trailer cover we manufactured for a customer. 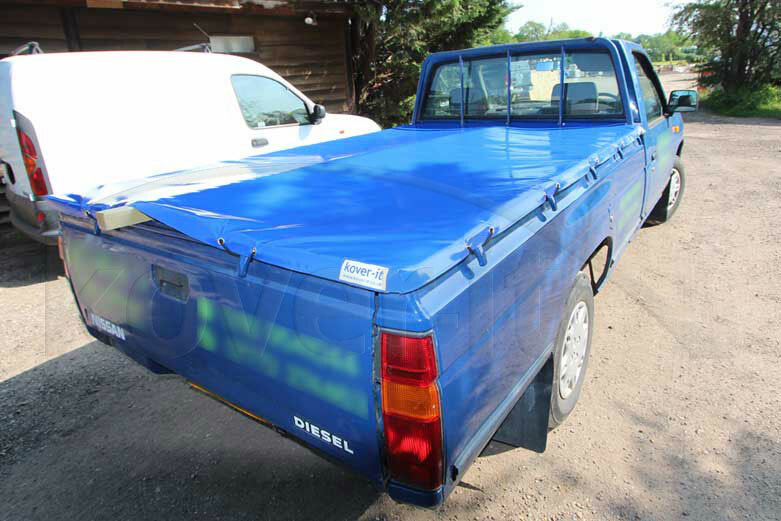 As you can see it is very different to the trailer cover above, this is also referred to as a heavy duty truck bed cover. This blue heavy duty trailer cover was custom made to the customers measurements, and is designed to be easily secured and removed. There is a metal baton which secures the cover at the front, and eyelets and a shock cord which make it easy for the cover to be secured to the vehicle by hooks at the side. This design allows the customer easy access to the back of the truck, without having to take the whole cover off, as you can see there is also the ability for longer items to still fit in the truck. 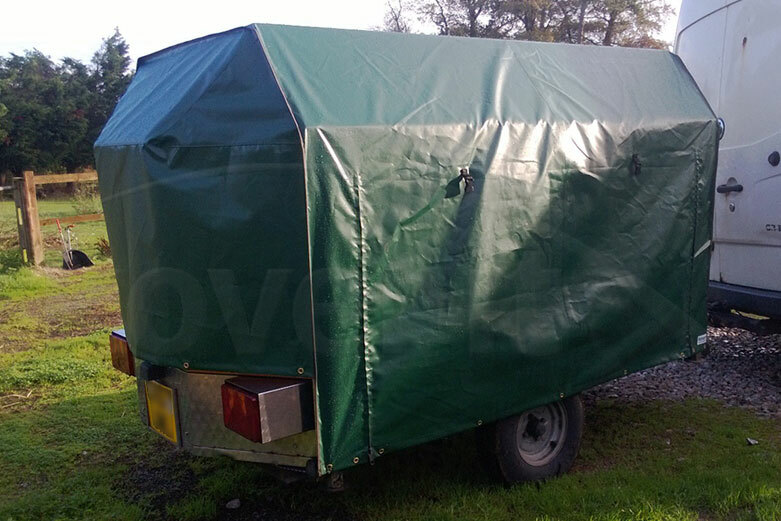 Having a custom made heavy duty trailer cover manufactured from PVC-ST which is well fitting also helps prevents air from getting underneath, which could cause the cover blowing off or getting ripped. As well as the 2 trailer covers above, we also manufacture many straight forward heavy duty rectangular trailer covers which have a small drop, eyelets and shock cord to secure the cover in place. 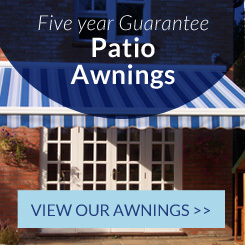 These are also manufactured from PVC-ST and come with 5 years guarantee. As well as manufacturing custom made high quality trailer covers to your specific measurements, we also offer a range of heavy duty waterproof trailer covers in standard sizes on our website, so if you are looking for a straight forward trailer cover its worth checking your sizes against our standard sizes of heavy duty trailer covers which we stock. 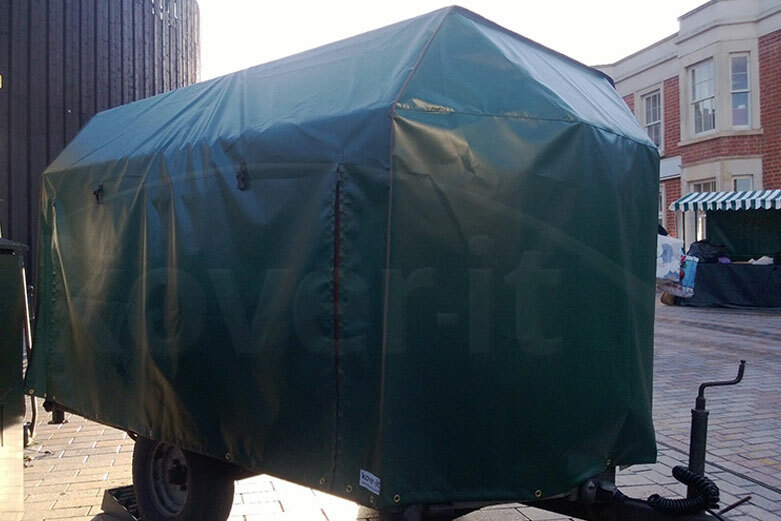 To get a quote or to find out more about our heavy duty trailer covers give us a call on 01189 406095, or email us at sales@kover-it.co.uk. Special thanks go to Churtopia for supplying Kover-it with the images.